The small state of Vermont might be on the other side of the world, but thanks to the global community of Rotary, International, a group of Vermonters is able to improve maternal health in remote areas of Longido District, Tanzania. 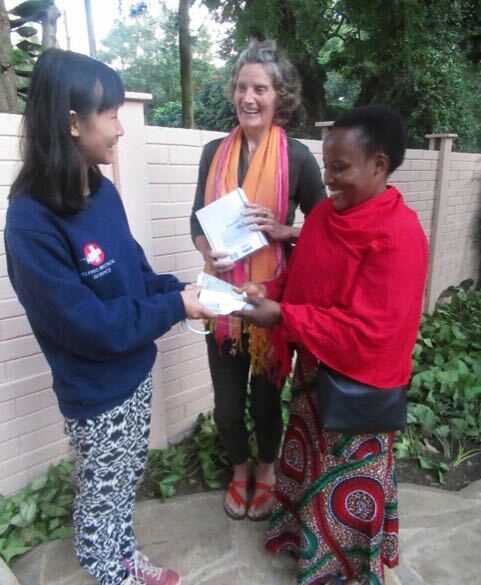 The St. Johnsbury Rotary of Vermont, USA, donated $1000 to the Natron Healthcare Project for the purchase of 20 Maternova Cradle blood pressure devices to be used in clinics and bomas throughout Longido. These hardy, easy-to-use sphygmomanometers will be used by midwives, clinical officers and others on the front line of maternal care to monitor the blood pressure of mothers-to-be. The Golden Sunrise Rotary Club of Arusha helped facilitate the donation. The Cradles are donated by NHP to the District Medical Office of Longido. The Cradles give numeric digital readings, but also simple lights indicating whether a blood pressure is normal, in a warning zone, or dangerously high. NHP trained TBAs in Magadini and Wosiwosi have already referred several pregnant women to primary care. TBAs then work with other community members to evacuate the mother. Without reliable transport – and, during the rainy season, without roads – the villages often rely on the Flying Medical Service to fly in for evacuations. FMS has also received several of the Cradles from Dr. Aeberhard’s organization, and finds they are quick, accurate and easy to use at the outreach clinics they provide throughout some of northern Tanzanian’s remotest areas. “Ideally, every woman gives birth in primary care,” says Melanie Finn, Dr. Aeberhard’s partner at NHP. “But if we want to save lives, right now, in these very distance places, we need to be practical.” Finn lives in Vermont and was approached by the St. Johnsbury Rotary when Rotarians heard about her work with predominantly Masai communities in Natron. Improving antenatal care is deeply personal for her. She lived in Magadini for three years, witnessing the difficulties local people – especially mothers and children – had in accessing healthcare and understanding their healthcare issues. She and Dr. Aeberhard founded NHP in 2008. This entry was posted in Uncategorized and tagged Cradles, Golden Sunrise Rotary Club, Longido, Rotary. Bookmark the permalink.